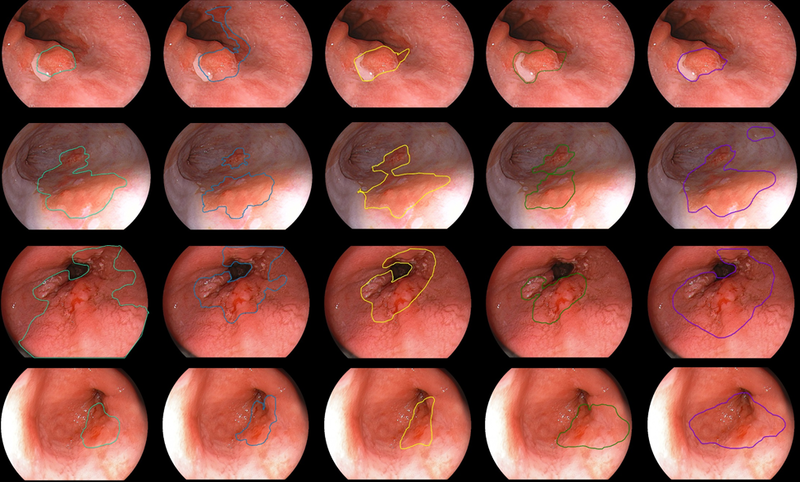 The data consists of 100 HD endoscopic images captured in 3 clinical procedure rooms . The set contains 50 examples of early cancerous lesions and 50 examples of non-cancerous tissue, including pathology data. The lesions have been annotated independently by five leading European medical experts in order to obtain a golden standard. See some example annotations below, where each expert used a different color for delineation. The set contains images of 39 patients (17 cancer, 22 no cancer) with sufficient variation in age (23 - 92) and gender (12 female, 27 male -- incidence in men is significantly higher). Due to the high resolution of the images (1600x1200 pixels), ample training samples can be obtained by the use of block-based processing. For example, using 50x50 pixel non-overlapping windows, over 75.000 useful training samples (i.e. within the region of interest) can be obtained. The first set of data consists of 50 images of 19 patients (8 cancer, 11 no cancer). This set can be used for algorithm development and experimenting with parameters. Download: Available at Data downloads. The second set of data consists of the full set of 100 images of 39 patients (17 cancer, 22 no cancer). This set is used to evaluate the performance of the algorithm.